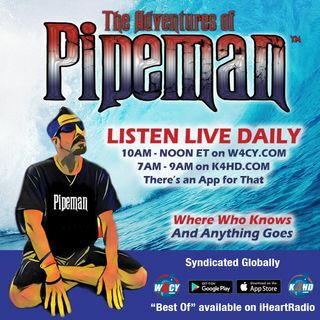 Take some zany and serious journeys with The Pipeman aka Dean K. Piper, CST on The Adventures of Pipeman also known as Pipeman Radio syndicated globally "Where Who Knows and Anything Goes”. Listen to a show dedicated to motivation, empowerment, music, comedy, celebrities, shock jock radio, various topics, and entertainment. Hosted by The Pipeman who has been said to be hybrid of Tony Robbins, Batman, and Howard Stern. This show is broadcast live and hosted by The Pipeman aka Dean K. ... See More Piper, CST every day 10am – Noon ET on W4CY Radio (www.w4cy.com), W4VET Radio, K4HD Radio (www.k4hd.com) part of Talk 4 Radio (www.talk4radio.com) on the Talk 4 Media Network (www.talk4media.com). Pipeman Interviews Felix from M.O.D.